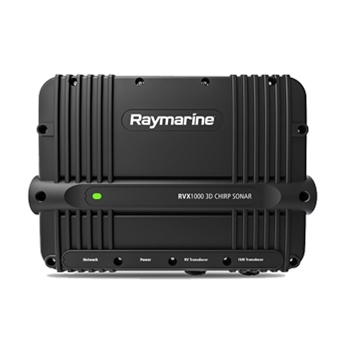 The RVX1000 3D CHIRP Sonar Module brings exceptional underwater sonar images to your compatible Raymarine MFD. Dual sonar ports support both RVX transducers as well as 1kW CHIRP. Compatible with all LightHouse 3 enabled Multifunction Displays running software version 3.4 or higher. Sonar Box providing 3D Views! Exceptional Sonar performance and features are now available in a remotely mounted black box! Offering all of the sonar features found in a Raymarine Axiom Pro, the RVX1000 from Raymarine includes high powered 1kW dual channel CHIRP Sonar, RealVision 3D, CHIRP Side and DownVision all housed in a compact black box! Pair the appropriate transducer and receive the most advanced sonar features available on the market today. 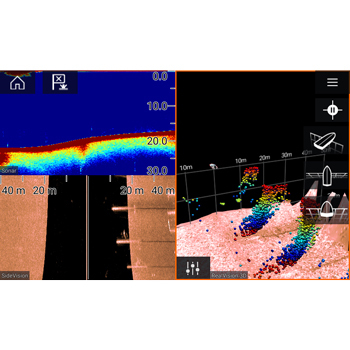 With 5 channels for both inshore and offshore fishing, the RVX1000 includes RealVision 3D which will easily identify structures and locate fish with the life-like clarity, while also providing near photo like detail below and to the sides of your boat (CHIRP DownVision / CHIRP SideVision). Add to that the ability to select from Low, Medium or High CHIRP you are sure to get the best definition and target separation. 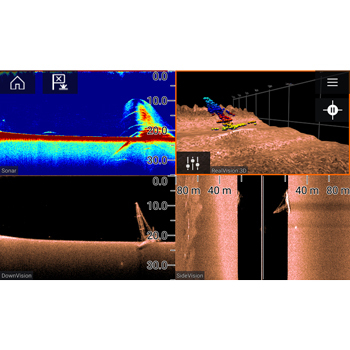 Advanced Sonar features include Sonar Scroll Back allowing you to rewind, pause and playback up to 10 minutes of recorded sonar history enabling you to look closer at fish and structure that you may have passed by! And, with TruZoom magnification you can reveal extra target detail without loss of resolution! With its dedicated Quad-Core Processor, the RVX 1000 can pair with Raymarine's eS and gS line of Multi-Function Displays and simultaneously run multiple sonar channels and not worry about any compromise in performance. If you are looking for the best in Sonar for your Raymarine eS or gS MFD look no further that the RVX1000.